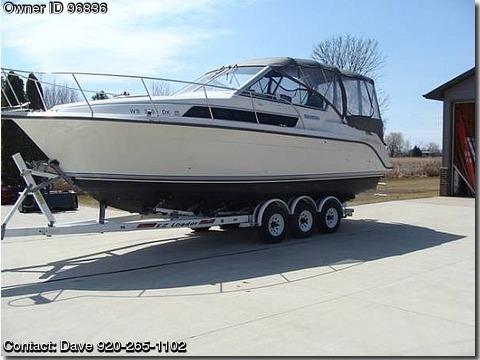 Please contact the owner directly @ 920-265-1102 or dwilliquette2@new.rr.com.1993 Carver, Model is a 280 Montego. The boat is in excellent shape and is powered by a 454 Volvo Penta gas engine. It has body stability &amp; plenty of interior space with its 9&#39;6&quot; beam &amp; cabin headroom of 5&#39;11&quot;. The 280 sleeps 6 with convertible dinette, forward V-berth and mid-cabin. Her galley includes stove, refrigerator, stereo w/am-fm radio, shower, mirrored vanity w/sink &amp; storage, all new cushions, upholstery and curtains put in last summer(2013). The helm includes console with full instrumentation, cb radio, double wide helm seat, companion seat, cockpit lounge, table, ice chest, bow pulpit &amp; swim platform. Complete canvas with windows for rain/weather protection when ridng or docked &amp; regular canvass for closure. Includes the EZ Loader tri axle trailer. Also includes slip at South Bay Marina in Green Bay at the mouth of the bay for the 2014 boating season.